Still the same as I visited the first day. Peaceful, nice & cozy! Hôtes très attentionnés et accommodants. Très bon accueil et départ chaleureux (avec un petit café et un gâteau). Navette pas chère pour l'aéroport. Chambres joliment décorées, pas impersonnel. Douche chaude ! Air conditioned, friendly staff, and great location for an incredible price! Hostels are a great way to stay in Bangkok for good value, so you can save your money for exploring. You can check out the temples and other cultural highlights in this destination, as well as activities like shopping. What Can I Do in Bangkok? You can search for flights to the nearest airport in Bangkok (DMK-Don Mueang Intl. ), located 12.7 mi (20.5 km) away from the city centre. An alternative is Bangkok (BKK-Suvarnabhumi Intl. ), situated 14.9 mi (24.1 km) away. When you're out and about, you may want to use public transport during your trip. 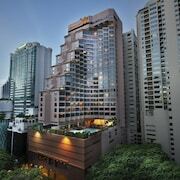 Nearby metro stations include Siam BTS Station, Rachathewi BTS Station and National Stadium BTS Station. To check out more of the surrounding area, take a train from Bangkok Makkasan Station, Yommarat or Bangkok Hua Lamphong Station.